Up to 100% more plaque removal: round head cleans better for healthier gums. Dynamic movement helps you achieve enhanced cleaning results. Dentist-inspired round brush head oscillates, rotates and pulsates to break up and remove plaque. 1 brushing mode: daily clean. Content: 1 electric toothbrush handle with charger 2 Pin UK Plug, 1 toothbrush head. Oral-B, the #1 brand used by dentists worldwide. <> Rechargeable Brush with 1 mode and 1 brush head - 3D cleaning >< Ships with 2 pin plug> The Oral-B Pro 600 CrossAction electric rechargeable toothbrush provides a clinically proven superior clean vs. a regular manual toothbrush. The professionally inspired design of the Cross Action toothbrush head surrounds each tooth with bristles angled at 16 degrees, and 3D cleaning action oscillates, rotates, and pulsates to break up and remove up to 100% more plaque than a regular manual toothbrush. An in-handle timer helps you brush for a dentist-recommended 2 minutes. Best of all it?s brought to you by Oral-B ? the #1 brand used by dentists worldwide. 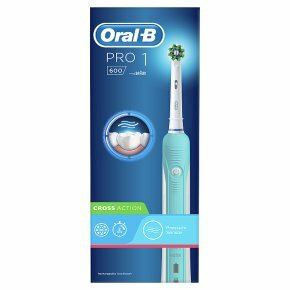 Oral-B Pro 600 electric rechargeable toothbrush is compatible with the following replacement toothbrush heads: Cross Action, 3D White, Sensi Ultrathin, Sensitive Clean, Precision Clean, Floss Action, Tri Zone, Dual Clean, Power Tip, Ortho Care.